You'll be £11.99 closer to your next £10.00 credit when you purchase The 1066 Hastings Campaign: The Dark Ages. What's this? Order within the next 8 hours, 26 minutes to get your order processed the next working day! Not only is Hastings covered in detail but also the first battle of the campaign against Harold Hardrarder's victorious Vikings at Fulford, Williams landing at Pevensy, along with Harold's march north to victory over the Vikings at Stamford Bridge. Vignettes provided by leading living historians help paint a vivid picture of the men who fought the three battles, along with their weapons. 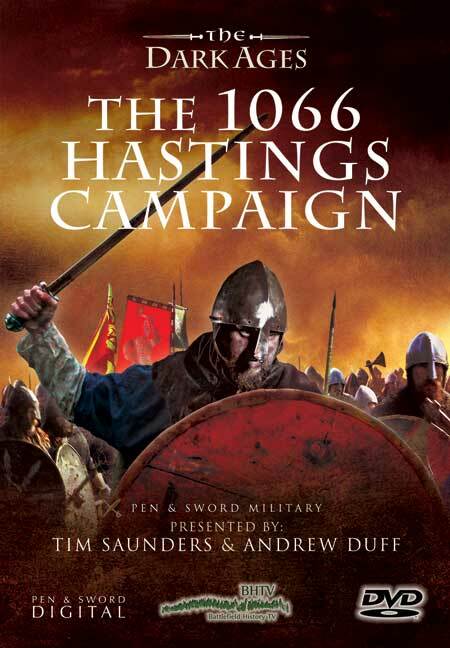 In their now well established and widely popular style, military historians Andrew Duff and Tim Saunders examine events of the 1066 Campaign through the eyes of experienced soldiers to bring fresh light on this classic English campaign. This subject of this production though better known than most topics tackled by the BHTV team, has none the less benefitted from the formula used in their other best selling DVDs, this includes location filming on the three 1066 battlefields, high quality maps and diagrams, complimented by excellent re-enactment footage and illustrative vignettes of life and battle in 1066. In addition, the presenters' understanding and experience of warfare provides a new insight into a campaign and battle that is often treated in simplistic terms. In their widely acclaimed way, the team successfully re-tell the story with insight but retain the essential drama of a campaign that could have turned in Harold's favour at a number of points.